Your cozy home-away-from-home awaits nestled among picturesque mountains. 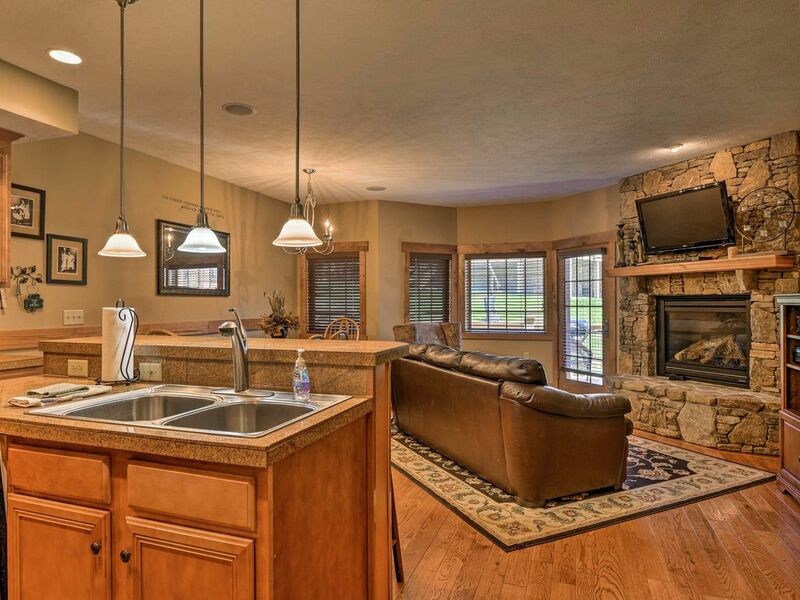 This true ski-in/ski-out resort vacation rental townhome is located on the 7-Springs Southwind area, with access to trails and the Seven Springs Ski Resort. Your party of 8 will love having community pool, hot tub and fitness center access as you stay at this 3-bed and 3-bath house. Curl up by the fire with a mug of hot cocoa after an exhilarating day of snowboarding, zip lining, hiking, fishing, or white water rafting! Watch skiers fly by from the living room windows of your vacation rental home, or break out the ski gear and join them! After a day on the slopes, sink into the large plush sofa and chairs in the living room and watch a movie on flat-screen cable TV. Refuel with a hearty meal each evening. Eat together at the dining table while chocolate chip cookies bake in the oven. After dinner, slip into your swimsuits, grab the key fob, and head to the community hot tub to soak your sore ski muscles. When your fingers are sufficiently wrinkled, dry off and head inside to play in the basement game room. A second TV is ideal for a late-night movie night if the parents are ready for bed. Each of the home's 3 bedrooms is furnished with comfortable beds, including a lavish king bed in the master room, promising a delightful night's sleep full of sweet dreams. Awake to the smell of fresh coffee and run down to the fully equipped kitchen to make breakfast. Eat a hearty meal of pancakes and bacon at the kitchen bar before another day of adventures in incredible Seven Springs. When you don't feel like cooking, snag a delicious meal at one of the numerous restaurants nearby. Satisfy your cravings with a slice from Rustic Mountain Pizza in Somerset or enjoy upscale cuisine at Helen's Restaurant in Champion. You'll love having direct access to Seven Springs Mountain Resort, with Southwind Ski Trail directly by the property. Shred pow all day and refuel your energy with dinner at the local favorite, the Foggy Goggle. You'll love the live music and family-friendly activities hosted at this popular restaurant. Snow-free months promise just as much fun, with Ohiopyle State Park and Idewild Amusement Park nearby. Go hiking, fishing, swimming, white-water rafting, and more! Spend a quiet day exploring Frank Lloyd Wright's iconic Fallingwater home or visiting the 9/11 Flight 92 Memorial. Seven Springs is a fun destination year-round, with zip-lining, mountain biking, and horseback riding in addition to the incredible snowboarding and skiing. You'll enjoy this beautiful location every month of the year. - Amazing ski-in/ski-out Seven Springs Mountain Resort location with access to skiing, snowboarding, mountain biking, zip-lining, restaurants, entertainment, shopping, and more! Wonderful property and great customer service by owner! We enjoyed staying here for a weekend ski trip. The ski-in/ski-out was great and much easier than past stays we have had along the village trail. This location is much more central to more beginner terrain and ski school, making it easier for our younger daughter. House is well stocked in the kitchen and with things to do and comfortable for resting when not skiing. Shuttle service was nice - would pick up and drop off at front door each time when we called them. We will look to stay here again next time we come back! This is a lovely place with fantastic access to the slopes. Midweek is the absolute best time to visit - it's worth taking off time from work or school, because you'll have the ski slopes to yourself. My only criticism is that check in is a bit more complicated than it needs to be because of the gate code, garage code, security system, etc. A keypad entry instead of keys would eliminate the need to mail keys back and forth, and make things simpler (fewer codes - make them all the same on the house). Beautiful location with plenty of room for our family! The weather may not have been perfect, but the location was! Lovely property, perfect for a ski weekend. We had a wonderful time at this property. It is truly a ski in/ski out property, very conveniently located. It is cozy, spacious, and well kept, each of the 3 bedrooms has its own bathroom. The owners are very helpful, informative, and very easy to contact, they kept us updated with each step of the process. We can only recommend this place!! Ski in sky out was perfect! Loved our stay very much! !